In the car yesterday, I asked my dragon boy if he wanted to pick up a pumpkin to carve when we got home. "I'd rather do something else," he said, after a moment's pause. Carving pumpkins is something my sisters and I always did for Halloween, though we rarely had any trick-or-treating visitors to welcome with a glowing garden good. Here we are in some homemade costumes. 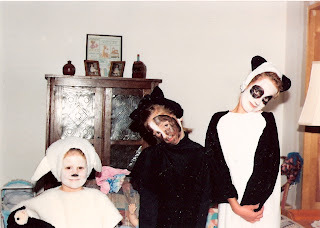 The year is probably about 1993; apparently also known as the Chinese Year of the Black and White Animals. I'm the panda on the right. Can you guess the end result? Don't mind the vampire in the mirror. My friends keep suggesting I capitalize on my lack of arm for a costume. Zombie, perhaps? One year trick-or-treating as a child, a woman answered the door to exclaim, "Oh my, she's even missing an arm! What a great costume! Seriously?! Kids are great for adults!